I've been working a lot lately. What days I've had off have been filled with a long list of chores and items to complete. 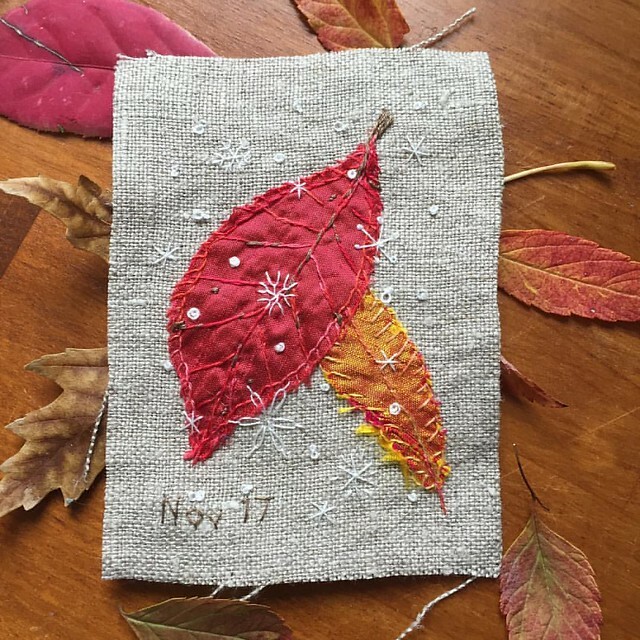 I've been missing my time with the needle, so I picked up a scrap of linen and some silk bits and stitched these autumn leaves and snowflakes ~ a tribute to the season's first snow, in the short amount of time I had before work one evening. 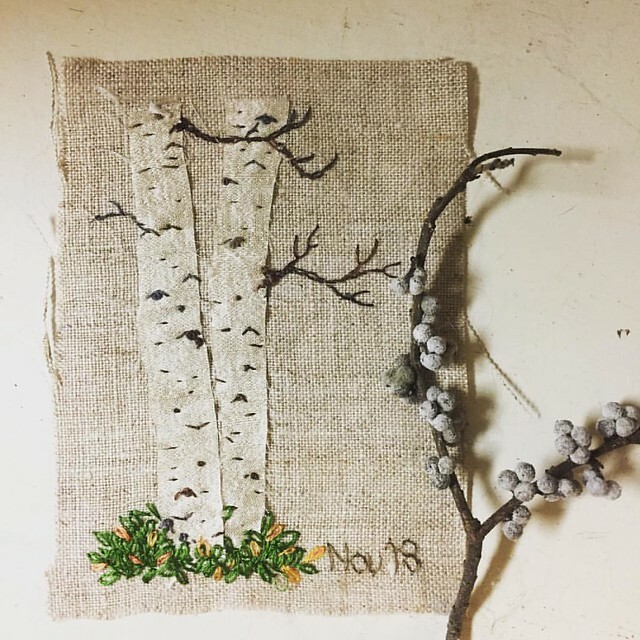 The next evening, I stitched the aspen trees outside my window. Then it was the quickly falling maple leaves on the tree outside the kitchen window. All these stitched in an hour or so, before heading out the door to work. 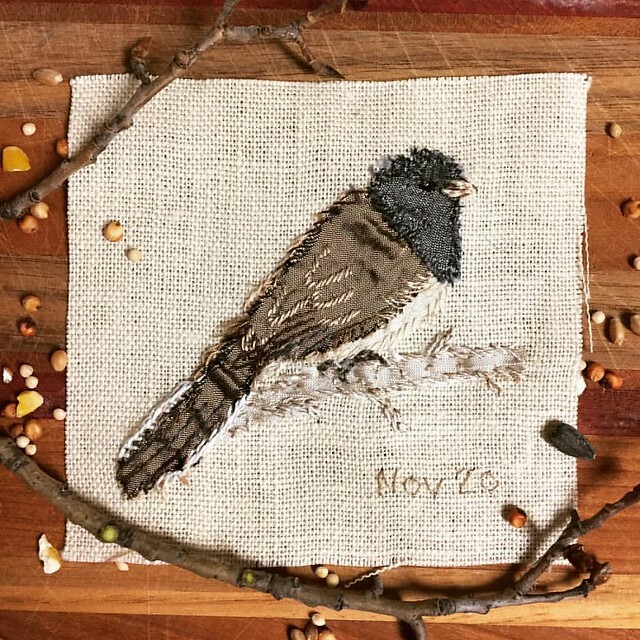 Sunday was my day off, a bit more time, so I stitched one of the Black Eyed Juncos that showed up with the snow this week. Winter must really be here since they have arrived! Though I work again tonight, I had to be up early for a work meeting, and try as I might, going back to sleep just wasn't going to happen. Perfect opportunity to spend a bit more time stitching. One of the squirrels searching for fallen seed under the bird feeders. 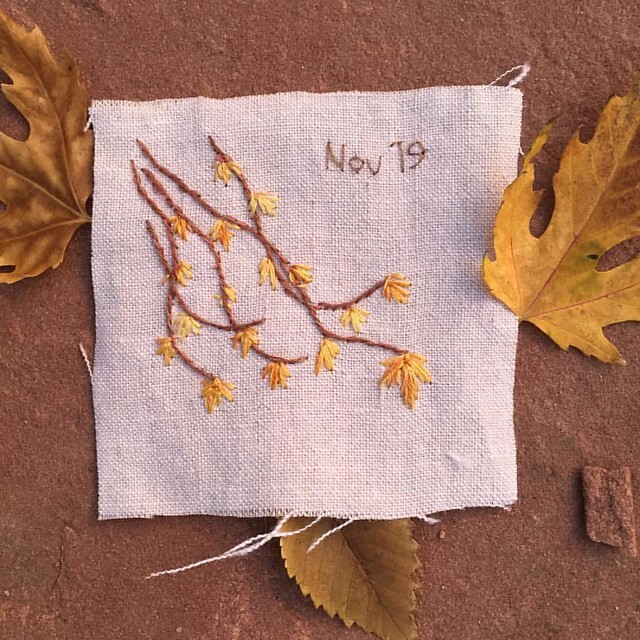 It's becoming a sort of nature/seasonal journal in thread on linen with a bit of silk. They are small, only about 3x4", edges left raw. What will I do with them? No idea just yet, but for now, I plan of keeping them all together and see where they take me! I've been posting them on Instagram, Facebook and Flickr. It's good to be playing with needle and thread. How long will these daily stitchings last? I have have no idea. As long as I have energy and time for them. And ideas. For a while, I sketched and/or painted daily. Then I did a photo-a-day project that lasted a few months. Now it's Daily Stitching. 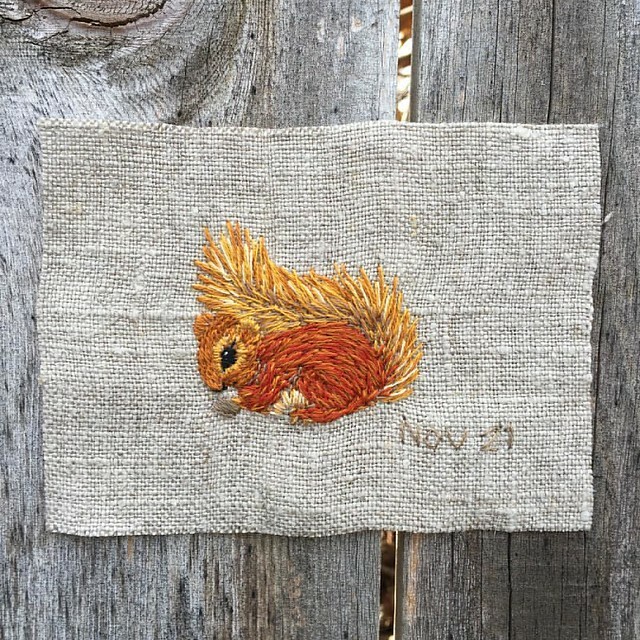 What sweet, delightful little needlework projects. I suspect you will continue until you feel an obligation to continue each day. But until that happens there is joy, release, and gratification in these little projects. The size is better than inchies too! Northern Indiana where our temps are still in the 40s and no snow. What beauty from just a few minutes here and there! Not only is your work delightful but the effort you take to create such attractive photo shoots is inspiring. I'm lucky to simply get a photo with good light. But with your shining example, I must try to be more artistic. Your daily stitching is absolutely perfect! Thank you for sharing! These thread sketches are so very nice... I can see you turning them into something beautiful... Winter Garden in thread. Thanks for the inspiration!